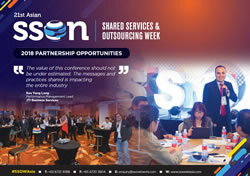 What role will you play at Asia's #1 Shared Services Show? SSON has been running conferences in Asia for 20+ years and has seen the market move from single function transactional centres to complex global business services. Through our network, we are seeing a market poised and ready to transform. The time is now, be a part of it! "Many thanks to the IQPC team for another successful SSON. Speakers and format were engaging, venue was great and many contacts new and old were made." "From Philippines to Singapore to China, t’s important for us to work with SSON and be represented here." Thought Leadership: With a room full of senior decision makers driving transformation projects in their organizations, this summit enables you to build your reputation as a market –leader in your chosen domain through panel discussion, roundtable discussion, workshops and so on. Branding: We bring together buyers and suppliers in a tailored location with unbeatable facilities for on-site branding and exposure. Furthermore, our dedicated marketing team can help you achieve your promotional aims in the months leading up to the conference with dedicated mailings to cover thousands of contacts through brochure drops, tailored web coverage, and more. Featured Networking: Focused and high level, this summit will provide you with the perfect environment to initiate new business relationships through one-to-one business meetings that overcrowded tradeshows cannot deliver. The SSON Excellence Awards Asia is the perfect place to get noticed by key decision makers in Asia. Branding Sponsorship - we can custom create branding opportunities with you! Sponsorship opportunities range from roundtable sponsorship, exhibition stands to sponsored lunches, cocktail receptions, gala dinners and a host of informal social networking events. Contact us now at +65 6722 9388 or email Sponsorship@iqpc.com.sg to discuss how we can tailor our sponsorship packages to suit your business objectives. Alternative, download the Sponsorship Prospectus for more information.